Two Tucson high schools are taking the stage to address tough social issues. Salpointe Catholic High School examines gun violence with the play “Bang Bang You’re Dead,” and Tucson Magnet High School presents “Our Border Town,” an original piece about immigration. School shootings and immigration are issues many high school students grapple with daily. Theater can be a healthy way to deal with these complex social problems, said Noshene Ranjbar, assistant professor of psychiatry at the University of Arizona. “Children have even less control over their lives than adults, so when they see injustices around them, their nervous system can react even more strongly,” Ranjbar said. Outlets such as art and advocacy are some of the best ways to cope with stressful situations and emotions, she added. By tackling the issue of gun violence with “Bang Bang You’re Dead,” Salpointe theater teacher Ericka Quintero hopes to be able to provide support for her students. The play, by William Mastrosimone, addresses gun violence in schools as well as mental-health issues. It premiered in 1999 and is based on a school shooting that occurred in May 1998 at Thurston High School in Springfield, Oregon, where a student shot and killed his parents, two students and wounded 25 others. Along with Mastrosimone, the play was written by survivors of the shooting and performed for the first time at Thurston High School. Salpointe is also participating in a nationwide campaign called “See/Hear Something, Say Something,” featuring open conversations about gun violence and encouraging students to speak up when they see or hear something suspicious or questionable. According to Quintero, the shooters say a lot in the majority of school shootings, but nothing is ever reported. “The school is working hard to raise awareness that we need to become vocal advocates for one another. 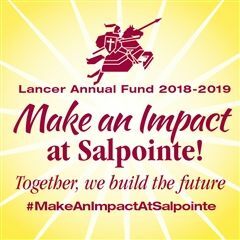 We want to help our students see that they have power,” said Dana Milne, Salpointe’s artistic director. The students involved in the production of “Bang Bang You’re Dead” say they are thankful for the opportunity to speak up about this issue and hope they can make an impact on their school and community. “I feel like a lot of things in this show hit home because some of these things are preventable,” said Sophie Smith, a senior who plays the shooter’s mother. Tommie Irish, a sophomore who plays the shooter, discussed the emotional toll that this type of production can have on young actors and how he prepares for his performance. By using theater to open a conversation about gun violence in the community, Salpointe students said they hope to help create nationwide change. “I definitely have a fear that this could happen to me, especially after the Parkland (Florida) shooting happened, because it was very publicized and there were actual videos from the shooting. It felt like this could really happen to us,” Smith said.